These muffins are a bad influence on me. The other day I was at a friends house storing some homemade ice cream I had brought over and I saw about half a dozen bananas in the freezer. I wanted them. So bad. Just so I could come home and make these muffins. All I have left in my freezer is one shrivelled up little banana and there are no bananas in the house right now let alone over ripe ones. Don’t worry guys I resisted. Only because it’s a gluten free household and I couldn’t have offered her a few muffins in exchange for the bananas – yes, I did think of that. I was about to wax lyrical about these muffins, but really – with a name like Nutella Swirl Banana Bread Muffins is a sales pitch really needed? You kinda get the picture right? Yes, I said get the picture and then inserted a picture below that. I am so not corny. Okay so here are my favorite parts about this muffin – the chocolatey swirl, the caramelly undertone of the browned butter (only 1/4 cup! ), and that it has half a cup of brown sugar making it less sweet, but perfect for a breakfast that feels more indulgent than it is. Win win I say, win win. A big ol’ thank you to Jess over at On Sugar Mountain for sharing these! Now if only I had more bananas…. Pre-heat oven to 350 degrees and grease/line one 12-cup muffin pan with cooking spray or paper liners. Brown your butter: add butter to small saucepan and heat over medium-high heat, stirring constantly once it’s melted. Continue heating butter and stirring constantly, until butter foams and then finally turns a rich caramel-brown. Take off heat immediately and let cool until ready to use. Now roughly chop your bananas, I prefer to just puree mine, but your call entirely. Whisk together milk, vanilla and egg in a small bowl. Once butter is cool, stir into milk and egg mixture. Combine flour, brown sugar, baking powder and salt in a large bowl. Pour wet ingredient mixture over flour mixture and stir with large wooden spoon until a few streaks of flour remain. Fold/stir in bananas. Fill cupcake liners 3/4 way full with muffin mixture, then add one tsp of nutella to the top of each muffin. Then pretty-swirl it into the batter with a toothpick. Bake at 350 degrees for 20-22 minutes, until muffins spring back when gently pressed with your finger or a toothpick inserted in center comes out with only a few crumbs attached. Ferrero Rocher Brownies – Large enough for a crowd, but good enough to eat by yourself! I basically started baking with Nutella to stop myself from eating it with a spoon! they look so good… my daughter wants me to make some just like these now! These muffins look soooo good….I haven’t bought Nutella in years 🙁 When I was in high school I would always have 1/2 a nutella sandwich along with my lunch…unfortunately I have become more health conscious so it no longer makes it into my grocery cart…My kids have never had it…if they ever do they will constantly be on me to buy it. I already have a hard time trying to avoid Froot Loops. 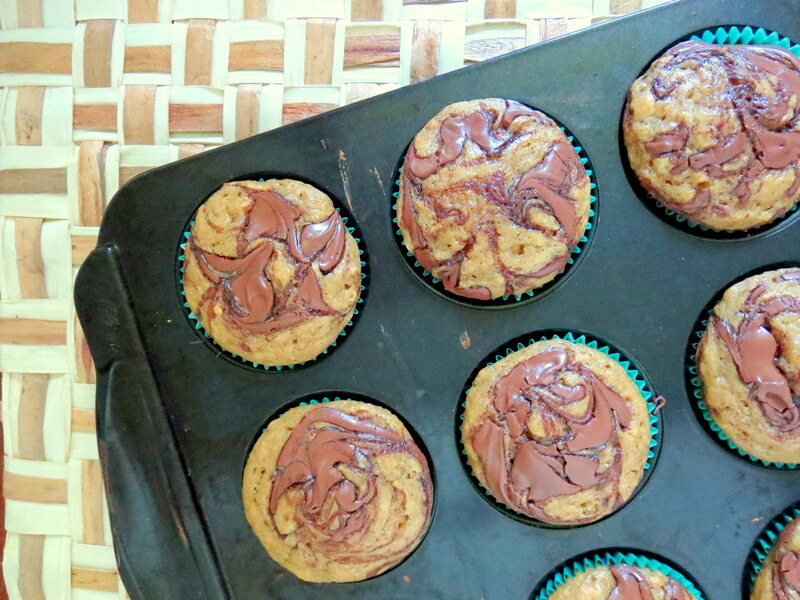 Nutella and muffin combination absolutely look perfect, thanks for sharing. Gahhhh I just gained 5 pounds looking at these pictures! It’s a whole lot worse when you eat them *looking shamefaced*. I think I am also going to have to put my ice cream machine away for a bit.. it’s getting a little crazy here! You’re actually making me drool while looking at the pictures. Again, I’m totally pinning this! I can say that these are the best muffins I have ever made. Yumness overloaded!! Family loved it! Thanks a lot. I would loooove to make this right now, but if I don’t have brown sugar, can I use regular sugar instead?? What difference would it make?? they’ll be sweeter, but go for it! let me know how they turn out!